For more than 50 years, the North American Aerospace Defense Command, better known as NORAD, has turned America’s most powerful radars skyward to track Santa Claus on his annual global toy—or lump of coal—delivery. What has become a holiday tradition for children and aviation geeks like myself did not begin because NORAD thought that Santa Claus posed a risk of nuclear armagedon at the height of the Cold War. It started because of a typo. 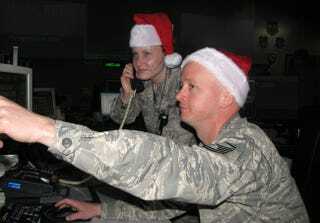 Soon, the airmen were playing along too, and they began plotting Santa’s position on their big map and provided updates to young callers anxious to know when Santa would arrive. And NORAD has been playing along ever since. Shoup died in 2009, but his legacy lives on, and now children can track Santa Claus through the Internet with the official NORAD Santa Tracker, or with a smartphone app.